When you shoot photos with your Nikon D3100 or D5100 and its built-in flash, the camera attempts to adjust the flash output as needed to produce a good exposure. 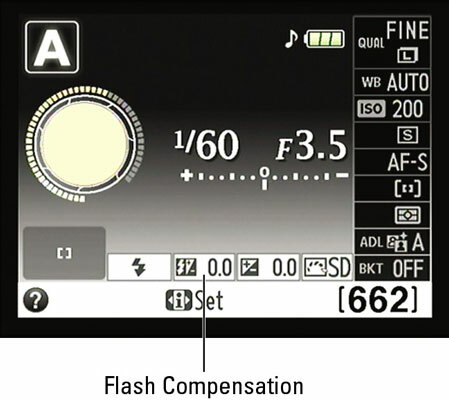 But if you shoot in the P, S, A, or M exposure modes and you want a little more or less flash light than the camera thinks is appropriate, you can adjust the flash output by using Flash Compensation. This feature enables you to override the camera’s flash-power decision. 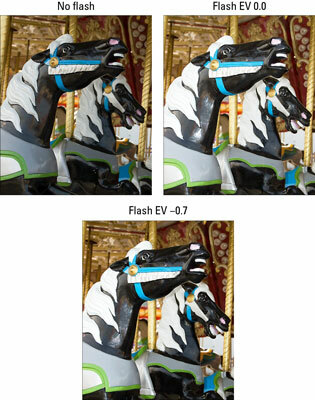 A setting of 0.0 indicates no flash adjustment; you can increase the flash power to EV +1.0 or decrease it to EV -3.0. As an example of the benefit of this feature, look at the carousel images. The first image shows you a flash-free shot. But at normal flash power, the flash was too strong, creating glare in some spots and blowing out the highlights in the white mane. By dialing the flash power down to EV -0.7, a softer flash straddled the line perfectly between no flash and too much flash. As for boosting the flash output, well, you may find it necessary on some occasions, but don’t expect the built-in flash on any DSLR to work miracles even at a Flash Compensation of +1.0. Any built-in flash has a limited range, and you simply can’t expect the flash light to reach faraway objects. In other words, don’t even try taking flash pictures of a darkened recital hall from your seat in the balcony; all you’ll wind up doing is annoying everyone. Use the two-button plus Command dial maneuver. First, press the Flash button to pop up the built-in flash. 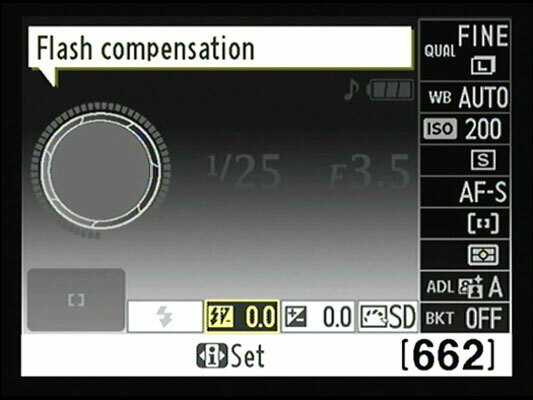 Then press and hold the Flash button and the Exposure Compensation button simultaneously. In the viewfinder, the current setting takes the place of the usual frames remaining value. While keeping both the buttons pressed, rotate the Command dial to adjust the setting. Use the Quick Settings screen. Just bring up the Shooting Info display, press the Info Edit button to shift to Quick Settings mode, and highlight the Flash Compensation setting. Press OK to display a screen where you can set the flash power. Press the Multi Selector up or down to change the setting and then press OK.
As with Exposure Compensation, any flash-power adjustment you make remains in force, even if you turn off your Nikon DSLR, until you reset the control. So be sure to check the setting before you next use your flash.